This past weekend, strawberries hit peak season, and across the state, small towns celebrated with strawberry festivals — afternoon affairs where locals convene for the sole purpose of eating strawberry shortcake. For Seven Days' second annual Cartoon Issue, we offer a fanciful take on this delicious, age-old Vermont tradition. 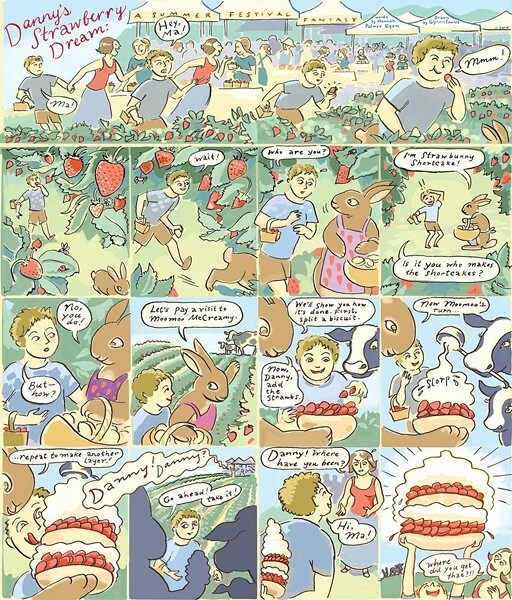 The Vermont side of the Upper Valley has a long strawberry history. Local historian Larry Coffin (disclosure: he was my teacher in high school), says Bradford's wide, fertile plain was once "synonymous with really fine strawberries." Between the 1840s and the 1960s, demand was so high that stores in Boston and New York would advertise "Bradford Berries" even if the fruit was actually grown elsewhere. At that time, Coffin writes on his blog In Times Past, migrant families flocked to the area, camping in the fields during the berry harvest. Several trains a day stopped at Bradford's depot to take on berries, and the railroad built an extra siding south of town to accept bushels from outlying fields. The heyday passed in the postwar period — due to blights, plagues and general agricultural decline — but Bradford continues to host an annual strawberry festival featuring berries from Pierson Farm and other area fields. The fest was last weekend, but Vermont's farms are still heavy with fruit, so if you haven't already, go pick a pint and have yourself a shortcake. Seven Days caught up with Bradford Strawberry Festival's Linda Moore, who says the recipe is a snap: "Most of the [shortcakes] are Bisquick," she says. "It's just the recipe from the box." Every other Vermonter I know makes them the same way. As for the berries, Moore says it starts with a taste test. "It's about how sweet the berries are," she says. "That changes by year. And at the end of the season, they're sweeter ... The trouble is, we don't measure anything, we just throw sugar in until it's right." Also, buying the right cream helps: "The secret to the cream is using heavy cream, not 'whipping cream,'" Moore advises. "You can whip it the day before and it will not separate." The original print version of this article was headlined "Danny's Strawberry Dream" and "Berry Sweet"